About WMD’s. He did it to oust Hussein. Duh. I’m sure Bush, Cheney, and company will now offer their heartfelt apologies for going to war on a lie. Although one wonders why we need 50,000 troops to stay behind now that it’s over. Heard on the radio this morning that the month of July was the bloodiest month in over two years in terms of Iraqi deaths in excess of 500. The US military is disputing the numbers, but I”m not sure what the motive would be for the Iraqi government to inflate them. Obama says that 90 thousand troops are being “brought home,” which is good news; but are they coming home or being redeployed to Afghanistan? I’m probably in a minority of one who doesn’t find the shoe incident particularly funny, especially not after hearing/reading reports that the individual is being tortured in custody. However, I haven’t had time to read up with any kind of depth. I’m not going to get in to the debate over whether the action was appropriate, nor whether it should be considered a symbolic protest rather than an assault. I’m more concerned with the fallout. Does anybody have a link to a story to get me caught up? Hopefully I’ll have something intelligent to say about it later. First the Iraqi government gave Senator Barack Obama a boost by seeming to embrace his proposal for a 16-month timetable for withdrawing American troops from Iraq. But could Senator John McCain, who built his candidacy in large part on his opposition to a timetable for withdrawal from Iraq, possibly be following suit? For months Mr. McCain, the presumptive Republican nominee, has railed against setting timetables for withdrawing from Iraq, and has criticized Mr. Obama, his Democratic rival, for suggesting one. But in recent days the debate has shifted as Iraqi officials, including Prime Minister Nuri al-Maliki, moved closer to Mr. Obama’s position. In the interview on CNN Mr. McCain first seemed to downplay any possibility that Mr. Maliki would actually ask for the United States to withdraw its troops in the next 16 months to two years. “He won’t,’’ he said, explaining that he knows Mr. Maliki well. Then, asked why he thinks Mr. Maliki had called 16 months a pretty good timetable, Mr. McCain gave his enigmatic answer. Now, can someone educate me on the whole Iraq-Pakistan border issue and the subsequent CBS editing of the interview to mitigate matters for McCain? Addendum: Obama in Berlin, Ich bin nicht Bush. You can find the whole speech pretty easily at Youtube. Meanwhile the situation has risen to the level of Theater of the Absurd. The media is now hammering the theme that they are favoring Obama. I always knew that the Right would push this theme, but they don’t have to. It is now all over the news. Apparently equal coverage is required for a speech before 20 in Berlin, Ohio and a speech before 200,000 in Berlin, Germany. Obama was gracious enough to take the McCain advice and make the trip, now he is being accused of overstepping his role as a candidate.The media’s motivation is not a mystery, rather a multiple choice question. Clearly they have an interest in keeping the race competitive. They have always been intimidated by claims they have a liberal bias. They seem to crave respect from the right wing audience, and they seem to also crave Senator McCain’s friendship. Or perhaps it is out of deference to a preexisting good relationship with the Senator that they are showing him such kindness. Now, normally it might have taken days for the story to break in the US press. Maybe it wouldn’t have received any attention at all. But somebody in the Bush administration, intending to distribute the story to an internal e-mail list, accidentally “hit the wrong button” and sent it to a much wider list. The unemployment rate probably just jumped one. The national security adviser to the Obama campaign, Susan Rice, said the senator welcomed Maliki’s support.“This presents an important opportunity to transition to Iraqi responsibility, while restoring our military and increasing our commitment to finish the fight in Afghanistan,” Rice said in a statement Saturday. Ezra Klein of the American Prospect explains the significance of the development. To really understand the importance of Maliki’s comments, you need to consider their opposite. Imagine if Maliki had walked in front of the cameras and said, “at this stage, a timetable for withdrawal is unrealistic, and we hope our American friends will not bow to domestic political pressures and be hasty in leaving Iraq just as the country improves.” It would be a transformative moment in this election. John McCain would talk of nothing else. The cable shows would talk of nothing else. Magazines would run thousands of covers about “Obama’s Iraq Problem.” Obama would probably lose the race. So how should McCain respond? Probably they just keep their cool and let it ride out, hope Obama makes some more centrist concessions, and harp on those as flip flops once Obama is back and his trip is no longer making news. But he’s got two problems coming out of this. 1. Obama is starting to look like a statesman internationally. That’s cutting into the one advantage the talking heads are giving to McCain. 2. McCain made a comment way back in 2005 to the effect that if the Iraqi government asked us to leave, we would have to leave. Having already flip flopped on long term presence, he will be hard pressed to flip flop on Iraqi sovereignty. 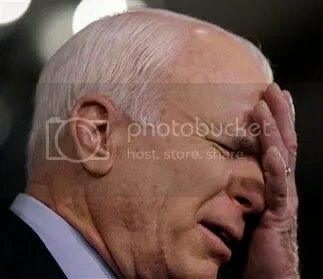 Right now McCain’s simply in denial. As one poster remarked, the timeline is popular with the Iraqi people and so Maliki’s hand may be forced by prevailing politics. But I wonder if the Bush people didn’t somehow manage to piss them off like they’ve done with pretty much everyone else. And this goes beyond the presidential election. It could actually mean and end to the war, or our part in it anyway. Third addendum: McCain, it turns out, does not believe in Iraqi sovereignty, making this flip-flop number 62. He doesn’t care what Maliki says. Fifth addendum: Turns out, Malaki’s only clarification was to emphasize that he’s not endorsing Obama for president. Even Fox reports it this way. — Sen. John McCain, quoted by Politico, apparently planning to still be in the Senate next year. A reminder – Clif Clendenen will be holding an event at Beginnings tomorrow evening beginning at 6 p.m. Despite what the initial posters said, the event is free. Lot’s of food. Music (including Steel Toed Slippers). Fun for the whole family. All are welcome regardless of campaign affiliation or endorsement. Cristina Bauss will sub in for me on All Things Reconsidered tonight. I believe the topic will be Richardson Grove. CNN spent a couple of hours on yesterday’s 5th anniversary of the war asking “was the war worth fighting?” The mainstream media framing leaves me cold often, but on this occasion I was ready to toss the television out the window (unfortunately, it’s not mine). The question is not whether it’s “worth” anything. The question is whether we have the right to attack a country which is no threat to us, however bad the regime may be – unless perhaps we are attempting to prevent genocide. But the genocide took place 20 years ago while he remained an ally against Iran. The conclusion? Well, if you take Wolf Blitzer and company to heart, it’s not about the mistakes of the past. It’s about what McCain will do in the future. The initial war support wasn’t an error in judgment because “everybody” made the same mistake – except Obama of course, but his stand doesn’t count because he wasn’t yet in the Senate. I am of course with my family in Monterey. I have fond memories, but as I’ve said previously, it’s no Santa Cruz. Monterey’s alternative newspaper readers chose Starbucks as the county’s number one coffee house. Did I mention that Monterey is not Santa Cruz? Their number one bookstore is Borders. Oddly enough, the seafood selection at Shopsmart in Redway is far superior to most anything I found today as I was hunting for wild caught shrimp. I finally found a specialty store in Monterey proper named Sea Harvest where the selection was maybe slightly better than Redway’s. More evidence we live in a blessed place. The parking meters in Monterey are electronic. They reset when you move your car. I wonder how long it took for that technology to pay for itself. Also annoying is the fact that the machines only accept quarters. I’ve shut down the comments in the last Reggae thread. I don’t have time to clean it up. Extra points to the first poster who can name the American novelist who used to sign off his letters that way. No, it wasn’t Steinbeck. There’s an upsurge in Iraq violence over the past few days and we were almost in a violent melee with Iran. I’ll post more about both later. Addendum: There are some questions about the official account. The photo comes from the same IPS page. “It is inappropriate that an administration which led our country into an ill-advised war in Iraq based on faulty intelligence could be so apparently irresponsible with intelligence on Iran,” Thompson said. I previously posted about the Kurdish war on Iran, and the Islamic solidarity elements of the anti-war movement assuming that the Kurdish groups were operating in conjunction with the American destabilization efforts. You’ve no doubt read the more recent news of fighting between Turks and the same Kurdish nationalists. Well, may to confound the anti-war movement, it turns out that we are providing intelligence assistance to Turkey in suppressing the Kurdish movement. This represents a change in policy. Pentagon officials are now starting to say publicly that the U.S. is flying manned spy planes over the border area, providing Turkey with more intelligence information, and that there are standing orders for American forces to capture rebels they find. Only last Friday, the U.S. commander in northern Iraq, Maj. Gen Benjamin Mixon, said he planned to do “absolutely nothing” to counter Kurdish rebels operating from the region. But the top American commander in Iraq, in comments that appeared aimed at allaying Turkish frustration over the matter, said Sunday the U.S. military was playing a role in trying to defuse tensions. Gen. David Petraeus declined to elaborate. Since then, however, Pentagon officials have detailed a number of examples to undermine the rebels of the Kurdistan Workers’ Party, or PKK, holed up in bases in northern Iraq. “`We are assisting the Turks in their efforts to combat the PKK by supplying them with intelligence, lots of intelligence,” Defense Department press secretary Geoff Morrell said. And so far I can’t find any comment from the Kurdish region provisional government. Update: The Kurdish Prime Minister has weighed in against the PKK. There will probably be some political fallout, particularly if he’s perceived as being an appeaser towards Turkey. This is all in the wake of PKK attacks on Turkish forces in September which resulted in the deaths of a number of Turkish troops. They seem to be doing quite well against Iranian forces as well. All of the sudden the PKK has everybody worried.